"I'm looking at House primary elections and trying to figure out if financial support is a good proxy for electoral support. In some of the multi-candidate races it could be interesting. Did the person who raised the most win? Did the person raised 3rd most money finish 3rd?" What you're asking is: Did money buy love in House primary elections? The quick answer is no. The amount of money that candidates spent turned out to be a lousy indicator in the outcome of last month's House primaries. 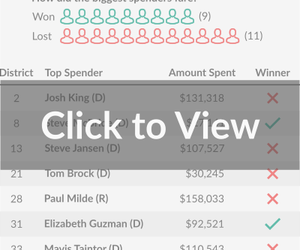 In primaries that didn't involve an incumbent, most of biggest spenders -- in 11 out of 20 races -- came up short. That is very different from general elections for the House of Delegates. In nearly 400 House elections involving both a Republican and Democratic candidate since 1997, the big spender won 78% of the time. If you narrow the list to races where both candidates spent at least $100,000, the chances of the big spender winning falls to 66%. The takeway? Money matters in politics, but perhaps not as much when you're talking about a low-turnout House primary involving candidates who tend not to be household names.